1920 – The Grand Prix d’Amérique is created to pay hommage to the Americans for the help which they gave to France during the First World War. 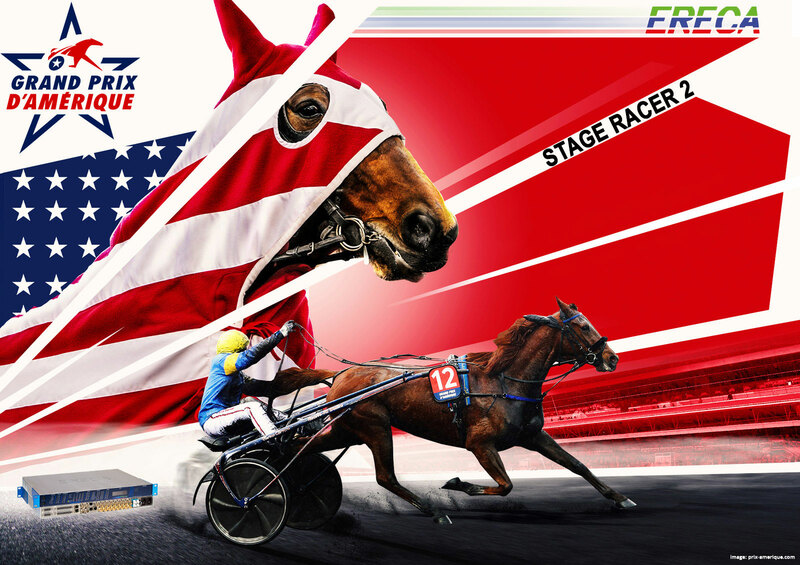 2019 – The Grand Premiere of the Stage Racer 2 on the Hippodrome de Paris-Vincennes for the Grand Prix d’Amérique. 18 – The best trotters in the world gather at Paris-Vincennes in quest of the title of Harness Racing World Champion. 2 – Only two Stage Racer 2, 24 channels, were required to manage the signals transmission between the control room compound of the racecourse, the Equidia TV set and the production OB-Van of the GTHP Groupement Technique des Hippodromes Parisiens. 36 – The number of countries which broadcast the Grand Prix d’Amérique on 4 different continents. 24 – The number of SDI ports available per Stage Racer 2. Each of them can be configured as input or output allowing multiple configuration possible depending on the requirement. 16 of those ports can accept SD/HD/3G SDI signals while 8 ports can accept SD/HD/3G/6G and 12G SDI. 40 000 spectators – The number of horse lovers and racing enthusiasts who go to Paris-Vincennes on the last Sunday of every January to see the Grand Prix d’Amérique. 400 – The total amount of Audio that can be handled by the Stage Racer 2 internal processing bus. However, the Stage Racer 2 can transport an unlimited amount of audio signals in the network. 50.63 km/h – The average speed, start stopped by Bold Eagle and Readly Express, the winners of editions 2017 and 2018 run on 2,700 meters. This speed corresponds to a mileage reduction of 1’11”2, record to beat. 160 GB/s – The bandwidth available per input and output for one Stage Racer 2 equipped with 4*40GB fiber trunks (at the speed of light). For any technical questions on this event, you can contact our French distributor Synoptic-Broadcast.